Australia is not short on beautiful natural wonders and one of the most spectacular of these is Victoria’s Great Ocean Road. 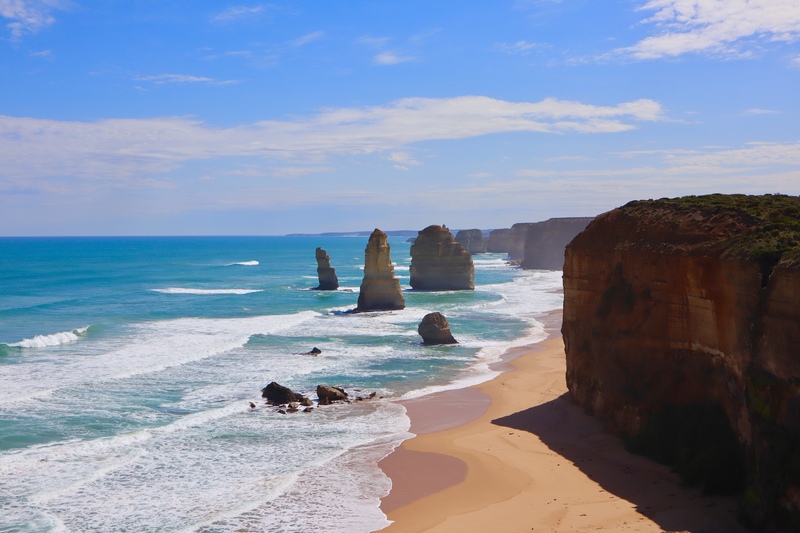 Two hundred and forty-three kilometres of stunning coastline along the south coast of Victoria, the Great Ocean Road is home to the famous Twelve Apostles, a series of limestone stacks in the Port Campbell National Park. The name can be deceiving, given that only eight of the formations now remain, the ninth collapsing spectacularly in the early 2000’s. Pounding waves and harsh conditions of the Southern Ocean over time eroded the soft limestone to create the formations, some of which are over 50 metres high. The Apostles were originally formed through erosion and it is erosion which is their greatest threat, with the salty sea continuing to erode the stacks at a rate of 2cm a year. Visiting the Twelve Apostles is free and there is a small cafe and tourist information at the site. One popular way to view the rugged coastline is by helicopter with a number of operators taking tours out over the ocean and up and down the coast. It can get very busy, particularly during holidays, weekends and over the warmer months so we suggest to try and visit on a quieter weekday. For more information on the Twelve Apostles and the Great Ocean Road visit here. Love Victoria? Visit here for one of Victoria’s cutest towns and here for a spectacular open garden to explore. Wow these photos are spectacular. I would love to take a trip down to Victoria to see this. We’ve driven the Great Ocean Road twice, in both directions, and the whole coastline is spectacular. On both occasions we were fortunate to pick mid-week summer days which were relatively quiet when visiting the Apostles. This is so beautiful – I have never seen water that color. It must be a stunning walk along the coast. Future blog post? Hi yes it’s so beautiful! New blog post coming this week..